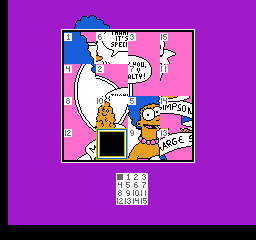 Readers to this blog may remember that in January of this year, I reviewed the first Simpson’s game that was released onto the Nintendo Entertainment System – Bart Vs The Space Mutants. For those who haven’t read it, click here to read it. Without revealing the ending, it wasn’t the best game on the system. Far from it in fact. So what better way to try and redeem themselves than by to release a sequel to the first game, but rather than focusing on just aliens, why not focus on everyone’s favourite cartoon family going global? It’s a win win for the publisher – guaranteed sales as it’s the Simpsons, and overall “acclaim” (word play on the publisher, Acclaim I assure you) that it’s better than the first game, how could the game be as bad as Vs The Space Mutants? 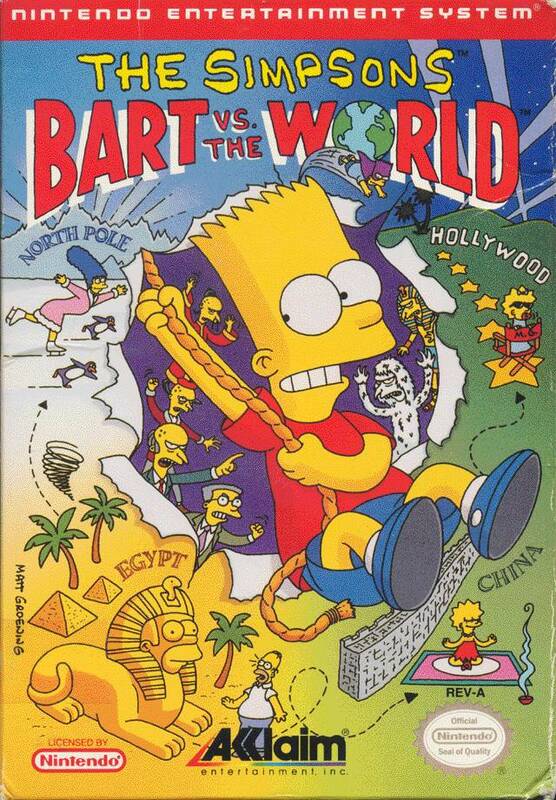 Bart Vs The World was released onto the NES in 1991, and is a side-scrolling platform game in parts that act similarly to Bart Vs The Space Mutants. 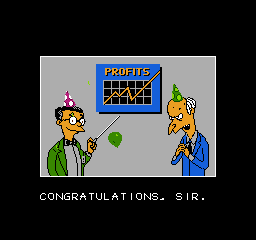 The plot of the game, which is probably the best thing if not the most believable part of the game, is that Bart wins an art competition on Krusty The Klown’s show that has been rigged by Smithers. Why would Smithers rig a meager art competition? Well, he is doing this in order to help Mr. Burns dispose of The Simpson family once and for all. Mr. Burns gets friends and family from all over the world to help dispose of Bart (which makes a change from getting friends and family round for a friendly game of Trivial Pursuit) whilst Bart travels the world in a scavenger hunt. So the plot can’t be faulted, it’s more plausible than alien’s taking over the world and hindering them by collecting hats and purple objects. Confused? Read the previous review! Congratulations on making a s****y sequel! So you turn on the cart and get presented with two options – start or practice. Without knowing what in fact you’re practicing, and with the thoughts of “practice” making the player have horrendous flashbacks of Ski and Die with its “practicing”, naturally you’re going to pick Start. Bart looks remarkably like he did in Vs The Space Mutants, to which this should be the first sign of danger, of a sense of deja vu, that feeling in your stomach that maybe the developers didn’t learn from their previous wretched incarnation. You’re then treated to the plot of the story before you come to another menu screen. You find you’re located in China and have the option of four different game modes – junk (which ironically sums up the game), a sliding puzzle game, a card match game and also a Simpsons Trivia section. The sliding puzzle game is a mini game that should be on the Game Boy, or anywhere else just not on the NES – trying to get the images in the correct location to form the image is not only tedious, but get’s boring incredibly quickly – how it benefits the game I do not know. The card matching mini game is one that is similar to the card matching game in Mario 3 – if you pick an incorrect pair 5 times then it finishes. Don’t worry, the game isn’t that cruel inasmuch you cannot replay it, but it’s best to bring a pad and pen with you to write down the locations of card’s you’ve uncovered. Why should gaming have to come to this – resorting to pen’s, pads and a certain amount of luck – what is wrong with just the controller in your hand and your gaming skills and reflexes, akin to a flamingo whose had a triple espresso and a vindaloo curry. The trivia section is the best of a bad bunch, if like me you’re a Simpsons fan then it’s good to refresh the grey matter on classic moments from the early seasons of the game. Finally, oh boy, we have “Junk”, and what an apt name it is for the mini game. 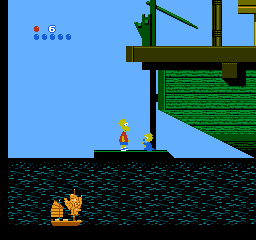 This is the part of the game that resembles Vs The Space Mutants, a shoddy platformer with bad controls, bad jumping and an overwhelming desire to throw the game into the nuclear chimneys at the Springfield Power Plant. You have to collect items on the screen, that may include Squishee’s for health but more importantly Krusty-brand souvenirs. It is a tedious process combing the levels for these souvenirs and items, and as mentioned your hampered not by the difficulty, but by the bad controls. 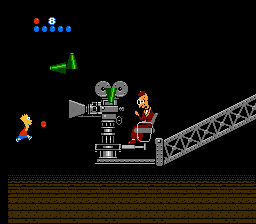 In terms of controls, well the d-pad moves Bart in the action/platforming levels, the A button makes Bart jump and the B button shoots a projectile should you have any balls to throw. To do a running jump in something like Super Mario Bros, you hold the B Button to run fast and then the A button makes Mario jump. Nice and simple and is a standard that is set as a benchmark for others to follow. Did Bart Vs The World follow this tried and tested method? Of course they didn’t – holding B doesn’t make Bart run, whilst pressing the A button makes Bart jump normally. No, by accident you will find that if you hold the A button and B button together, you’ll then run, and have to skillfully try to press the jump button at the right time to make ledges or collect certain items. It is still pointless and unnecessary, and could have easily been remedies from Bart Vs The Space Mutant, but they didn’t. For the mini-game, the A button is used for selection which comes as no surprise. The sound effects sound like something that could easily have originated from the Atari 2600 – now for an Atari 2600 game they were nice sound effects, although often recycled. Bearing in mind this game was made in 1991 and after the advent of Mario 3, you’d think that more effort would be made. Music wise, you hear the Simpson’s theme tune done in 8 bit, which although is ok, to hear it over and over again, I may as well stick a Simpsons DVD on, let the main theme loop constantly, which would be more fun.